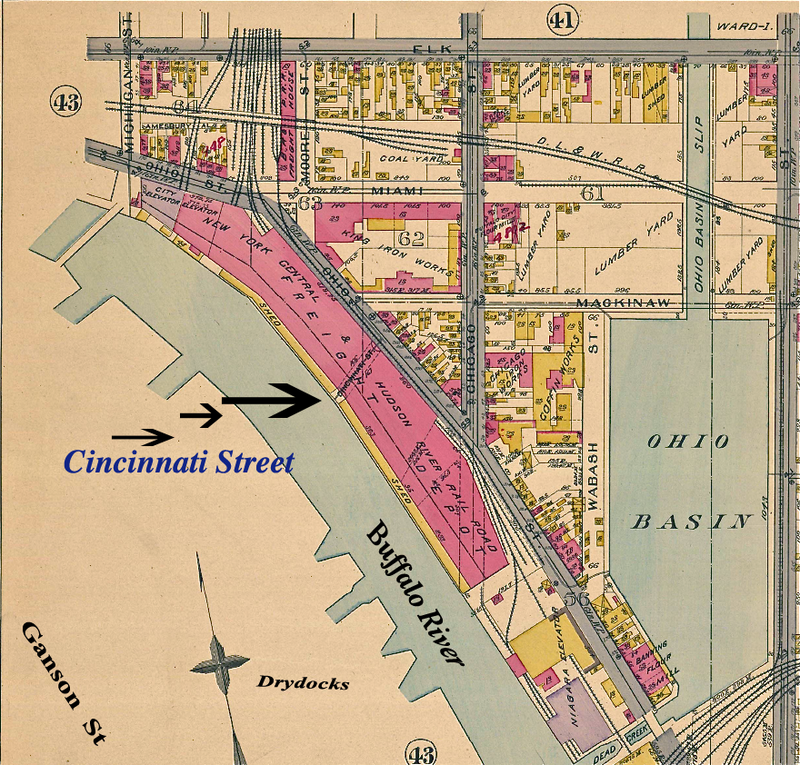 COVERED STREET - Did you ever hear of Cincinnati Street? It is a cobblestone thoroughfare, 1,900 feet long extending from Ohio and Michigan almost to South Street alongside the Buffalo River (and connecting directly to Ohio St. near Mackinaw) It was Buffalo's only "covered" street. Now it is bared to the sun, moon, weather and sky as the work of demolishing the New York Central and Ohio St. warehouse progresses. Like the grimy wreckage of it's roofing and the great loading docks it traversed, Cincinnati St. bespeaks of days when this was the busiest place in Buffalo, and of a freight empire long gone. 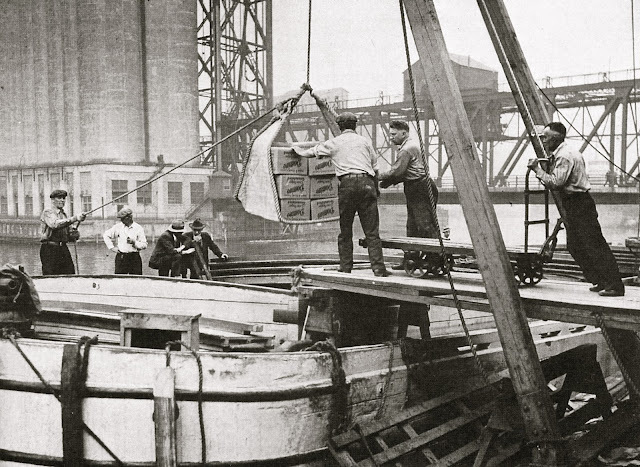 BUSY PLACE - Once the little street echoed to the heel pounding of nine gangs of stevedores (30 men to a gang) and the rumbling and grinding of the wheels of 200 freight cars every day. 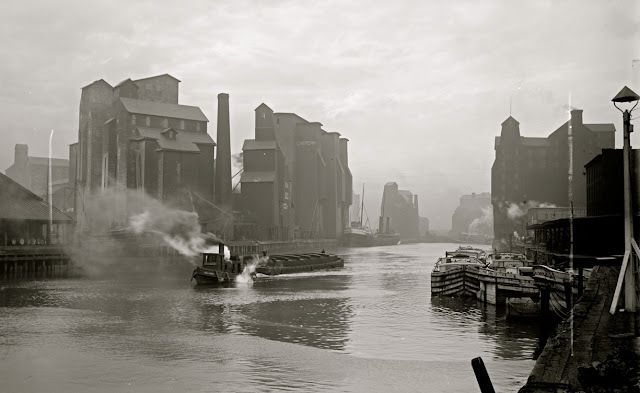 During the 7 1/2 month navigation season on the Great Lakes, a million and a half tons of freight were loaded onto freight cars traveling east and west from the tracks along side this street. 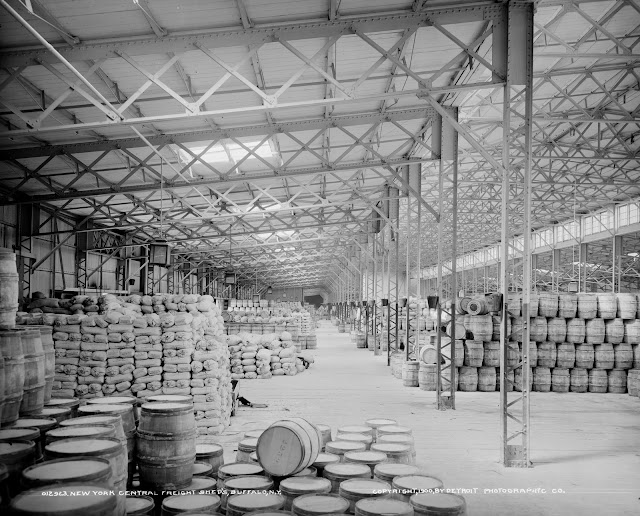 On the warehouse side of the street, 600 men toiled a ten hour day filling the boxcars. On the boat side the 270 stevedores unloaded the boats. East bound freight freight outnumbered the west bound three to one. The boats docked at the unit (Consolidated) dock at 5 a.m. and the stevedores went to work. From 7a.m. until noon 100 freight cars were loaded. Then they were pulled out and 100 empties took their place. By dark these were ready for departure. One million, 200 thousand tons of freight went east every day and 300 thousand tons went west. STARTED IN '27 - This combined operation started in 1927 when the Great Lakes Transit Corporation and six railroads consolidated their facilities. The railroads were the New York Central, Pennsylvania, Erie, Lehigh Valley, D.L. & W. and the B&O. 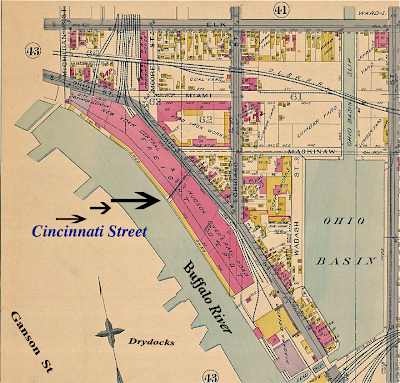 At this time Cincinnati St. which dated to the turn of the century, was deeded to the New York Central and the Ohio Street Warehouse, that is now being clawed into oblivion, was built higher and the street enclosed. There were six buildings: Section 1 and 2 west bound; and 3,4,5,6 for east bound freight. Cincinnati Street extended between No's 2 and 3. Four tracks each containing 25 railroad freight cars, flanked each building. 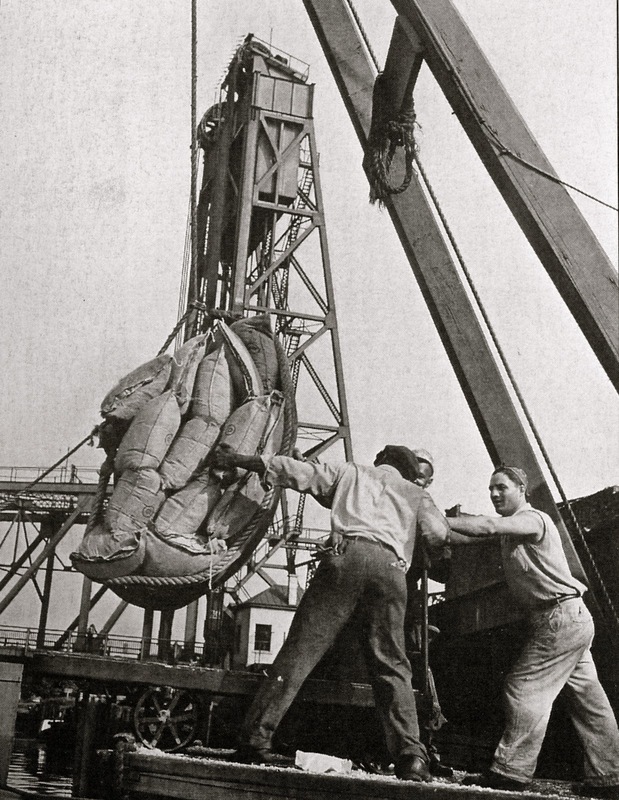 Prior to the combined operation it took two or three days to unload a lake freighter. Under the new system a freighter docked at dawn and could leave the same day. ONE LIGHT - Cincinnati Street had one electric light, an old carbon lamp high on the North side wall of the west bound warehouse. It may well be the oldest such light in Buffalo, and one of the first electric lights installed in the city. WWII ended this activity although Cincinnati Street and the 300,000 sq. feet of warehousing became busier than ever, but the area was closed for security reasons. After the war that nemesis of railroad freight--the highway express trucks--was in full flower. They are tearing the Ohio Street warehouse down for tax saving and the property is up for sale. 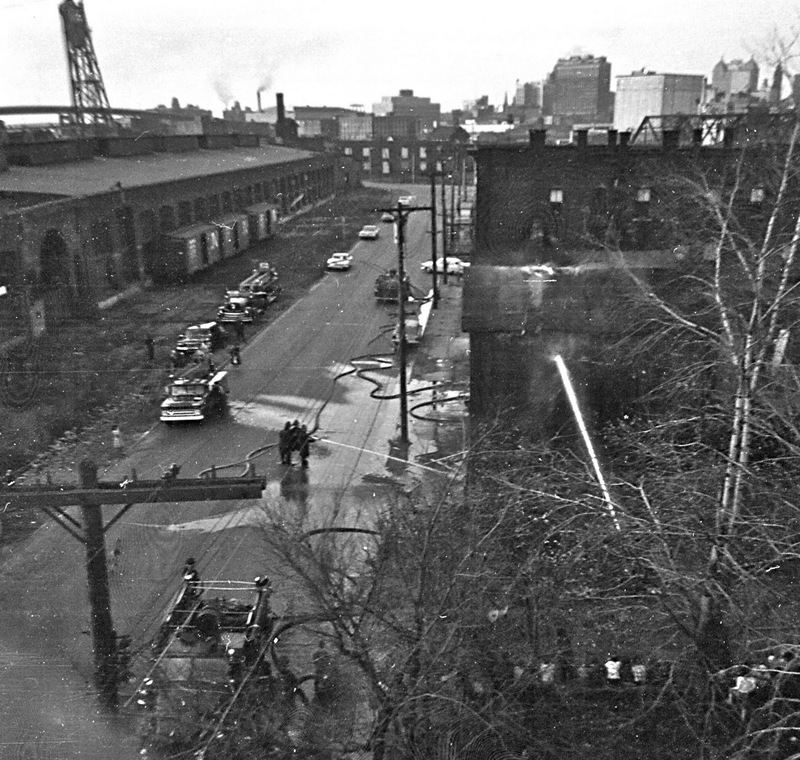 Warehouse on Left and the Curved Archway Which Was The Entrance To Cincinnati St.